The Christmas or New Year bird count ornithological activity – its values and drawbacks. This conservation resource was created by Simin (Claire) Huang, Chen Chen, Lifei (Nicole) Xu, Dorothy (QinYi) Dai. It is shared under a CC-BY 4.0 International License. The Christmas or New Year bird counting is an activity that aims to provide data in conservation biology. It is organized by the National Audubon Society, and it makes huge contributions to conservation. The organization has set up many data collecting locations around the world. Since the Audubon organization is a non-profit organization, the bird counting activity is opened to the public. Every year, thousands of volunteers from around the world participate in this event. People who are interested in bird counting can contact the complier of the nearby counting location to register as a volunteer. The volunteers in the same counting location work as a group under the complier’s management and support. The collected data will be handed over to the organization after the activity. The Audubon organization will organize the data and publish it online for public use. Bird counting data reflects the statuses of different birds and provides scientists with information to investigate and monitor bird species. Scientists can also predict whether the bird is endangered or not. The change in a population may reflect a change in bird’s habitats, such as the decrease or increase in food sources and population change in bird’s predators. Based on this information, humans can try to devise better protection strategies for specific bird populations. However, bird counting activities are open to both professionals and to the public, which means that individuals may participate without professional training. This public participation might cause the collected data to become inaccurate, if people mis-identify different bird species and growth stages. Moreover, birds are hard to track due to their fast movements, and the current searching methodology does not allow researchers to track each bird due to their large numbers. Therefore, avoiding double- and miscounting is challenging. Overall, bird counting does provide useful information for conservation, but it is not reliable and precise enough as a reference. Even though the data that is collected from the Christmas bird counting is not precise, it gives an information about endangered bird species and helps scientist to predict the change of ecosystem by the variation of the bird population. An ecosystem is where all of the organism living in an area along with abiotic components of the area that exchange energy with organisms. Organisms which live in the ecosystem are divided into basically three trophic levels which are primary producer, consumer and decomposer. Primary producers are autotrophic organisms which synthesize inorganic carbon dioxide to useable energy for themselves and other organisms. Consumers are heterotrophs which use living organisms as the food source. Because birds prey on living organisms, they are the consumer in a food chain. Decomposers are heterotopic organisms which break down dead or decaying organisms to gain energy. Organisms in different trophic levels interact with each other and form a complex food web in the ecosystem. Any variation in species will cause a significant change in the food web which will affect the ecosystem. The freshwater ecosystem is formed by abiotic factors and living organisms which are algae, zooplankton, fish, piscivorous bird and bacteria. these living organisms create a food chain among the ecosystem. Algae is the primary producer. Zooplankton, fish and piscivorous bird are consumers. Bacteria is the decomposer. In this food chain, the piscivorous bird is the top consumer which use fish as the food source. If the population of piscivorous bird decreases, the fish population will increase due to the lack of its predator. When fish biomass grows dense, the intra-competition for the food source and living space within the fish population will increase. it will reduce the growth rate and survival of the fish population. The inter competition between fish and zooplankton will also increase. Fish is the predator of zooplankton. Since the fish biomass increases, more zooplankton will be consumed which leads to the reduction of zooplankton population. Because the population of piscivorous bird decreases, the total food chain becomes shorter, so, there is less energy consumption. It causes the biomass of algae to increase. the increase of algae in water will cause a problem with limited living space and the lake of oxygen in the water. Since algae is the primary producer which has high reproduction rate, when the population of its predator zooplankton decreases, it has higher chance to grow and reproduce which uses up much space and oxygen gas in the water. Lack of oxygen and space underwater means the competition between zooplankton and fish individuals will be intense. Competition has a negative impact on fish and zooplankton which decreases both of their populations. The reduction of fish population means the reduction of food source for piscivorous birds which will finally reduce the biomass of the piscivorous birds. Because of the reduction of all fish, zooplankton and bird population, the species richness and species diversity will decrease which lead to an unstable ecosystem. Cereal aphids are a big threat to a growth of crops. Increase insectivorous birds population in fields can provide the biological control to reduce the population of cereal aphids. According to data from the article Insectivorous birds disrupt biological control of cereal aphids, cereal aphids damage about 10% of yields of the crop before harvest. Using an insecticide to kill the aphids is one way to solve the problem. The side effect of this method is insecticide may get into the ecosystem by water flow. When the chemical gets into animals, it cannot be discharged from bodies which harm their health. Another way to solve this problem is to use the predation relationship between bird and cereal aphid by increasing tree sparrows in fields. When the population of tree sparrows increase, the consumption of cereal aphids increases which will reduce the population of cereal aphids. The result of the experiment shows that introduction of tree sparrows excludes 44% to 72% of the cereal aphid density. Reduction of cereal population means the increase of attainable yields of the crop. In 1958, Chairman Mao, the leader of China decided to get rid of tree sparrows. By his calculation, one million tree sparrows consumed 4.5 million kg of grains per year. These grains were enough to feed about 6 million people so that the famine could be solved. Even though some scientists provided evidence that sparrows also ate insects that could reduce insect pest, their thoughts were ignored. His mobilization got good responses, at that year, there were about 196 million sparrows got killed, the population of sparrows reduced dramatically. This decision broke the ecological balance of the field. At the following year, a wild-range locust disaster happened in the farmland. Without its predator sparrows, the population for locust grew exponentially. The large area of paddy fields was destroyed that led to a mass famine. The cost of this disregarding nature's activities was paid by 30 million people' lives. Bird counting data helps to investigate and monitor bird species. The Christmas or New Year Bird count allows people to predict the endangered species of the birds, and scientists may be able to figure the solution for the existing problem. Counting bird numbers is the most direct way to know species information and the balance of the forest biological system. Also, it provides the information about the factors that affect birds population in the specific area, such as climate change affects the population. First of all, the annual bird count provides the number of bird species, which shows the well-being of the species. The biological condition is not only related to the bird, but also indicates the status of some other species. For instance, Little owl, which is a bird that feeds on insects, earthworms, small birds, and small mammals. The sudden change in the number of the Little owl may affect the population of its prey. The sudden population increase of the little owl can changes the other species. 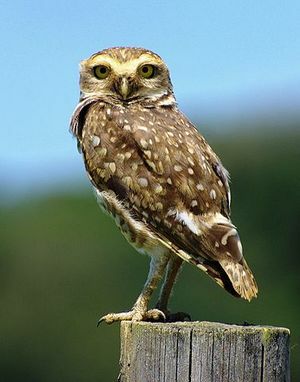 If the owl number is excessive, the small birds and mammals can experience a sharp shrink in numbers and eventually get to the stage of extinction, and later on the Little owl may also become extinct due to lack of food. Similarly, the shrinking may also happen to the population of insects and earthworms, which causes the further effect on its forest and prevents the conservation to happen. In contrast, if the owl is endangered, the prey may experience a sudden increase and a downfall trend later on. Also, diminishing number of prey can cause the little owl number to fall. The falling number of prey reflects the problem existing in the forest soil and plants; which suggests that proper forest management is required. Moreover, the changes in bird number can also show the existing problems in the forest. The unbalanced species may break down the sustainability and the scientists would have to develop new methods of forest management in order to maintain conservation. For instance, if the numbers of Little owl are excessive, people can introduce some bigger predators of the owls to cut down the increasing number. Some artificial hunting can be practiced too. Migration is a regular movement of the birds. In most cases, birds migrate because of the suitable climate and habitats. There are several ways of migration and different species develop their own way in order to get the best access of food resources and best suitable habitat. There 12 types of migration pattern. The most well-known type of migration is seasonal, which bird species travel from one habitat to another because of the changing season. The other two common types are latitudes migration and longitude migration, which birds travel between north and south or east to west. The bird count indicates different behaviors of birds. Some species needs migration, such as swallow. According to the record of Greek authors, swallow started to have the habit of migration 3000 years ago. The annual bird count provides valuable information which allows scientists to predict the habits of different species and wellbeing of the current ecosystem. The bird population reflects the abnormal problem in climate, because one of the main motivation of migration is the more suitable climate. Since the overall global climate is experiencing a series of rapid changes, which can delay or bring forward the time of bird migration. The bird counting indicates whether the climate is balanced, the suitable climate can prevent species become endanger. In this case, proper protection can be made, such as decrease the number of factories which produce air pollution or increase the use of public transit which slows down the greenhouse effect. Second, compare the population each year can provide a set of bird species population data. The large differences of number show the area is no longer a decent habitat for certain species, which means a biocentrism management should be practiced in the ecosystem. Third, migration also depends on the magnetic field of the earth. Plus, the magnetic field is affected by the general atmospheric circulation. These two factors can change the paths of migration each year which causes the differences in population, because birds can land in different area but similar climate habitats each year. Moreover, bird migration is an event which involves mortality, that caused by the hunting of human. Predicting numbers of bird can allow the government to introduce policies that set up regulation to maintain bird species population from trophy hunting. Even though there are over thousands of counting locations around the world, Christmas bird counting is more popular in North America and Europe than the rest of the world and therefore most of the counting locations are in these two continents. East Asia, North Asia and Africa has only a few counting locations. Thus, the population of the birds in these areas is not accurately known. The final collected data after the activity is incomplete and has large differentiation with the actual population and species of the birds. Bird counting activity is held within each designated counting area. The birds can easily fly across different counting locations. This can lead to duplicate counts, especially in counting locations of North America and Europe since they have a higher density of counting locations. The duplicate counts can cause more errors and differentiation between the collected data and the actual number of the bird population. This data can mislead the researchers, the government and non-government bird welfare organizations when they are drafting the protection acts of the endangered species based on the data. Christmas bird counting welcomes people with all skill levels, which means people with no experience or higher-level knowledge about birds can also take part in the event. The organization does not provide any training programs for the freshmen before the event starts. However, they have some online resources and tool-kits to support the new volunteers. Also, the compilers are experienced bird watchers and there will be at least one experienced volunteer in each group. But during the activity, it is not always possible for the compiler and experienced volunteer to support the freshmen. Birds are moving around and the volunteers are dispersed. The volunteer are allowed to take the photos of the birds and use the online software to identify the species of the birds. However, the identification software is not a hundred percent reliable. The birds are usually far away from the volunteers and they move quickly. The photos of the birds may not be clear enough to identify the bird species. Also, some species have similar appearances which make it more challenging to distinguish apart. 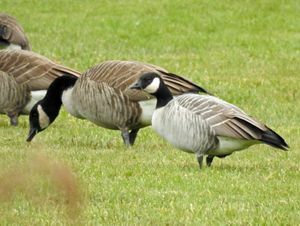 For example, in North America, the Canada Goose and the Cackling Goose look similar to each other. The only obvious difference between the two species is the body size. 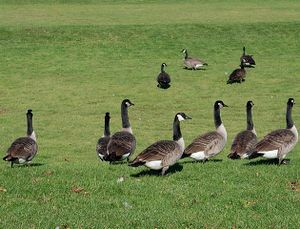 The Canada Goose is usually larger than the Cackling Goose. 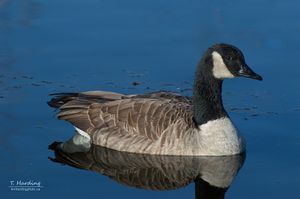 But sometimes, the immature Canada Goose may have the same body size as the Cackling Goose. If the goose is far away from the volunteers, it is hard to identify it. Using the identification software to distinguish them is also not an entirely reliable way. Besides, there are some species that have different appearances between the female and the male. 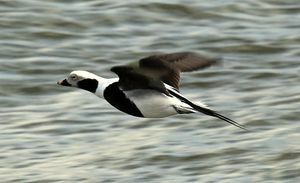 The Long-tailed duck is one of the examples. 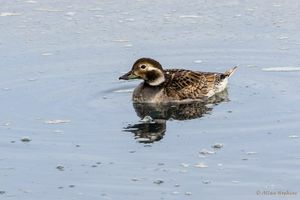 The female long-tailed duck does not have a long tail while the male long-tailed duck has long tail. Also, both female and male ducks have different appearances when they are in the breeding season. 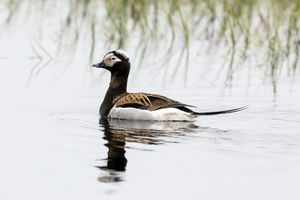 The female has a brown and white head and is covered by brown-feathers in non-breeding season. When the female is in breeding season, its head is covered by feathers that have a more brown hue. The male has whiter color in non-breeding season. When it comes to breeding season, most of the white feathers will become black. For the new bird watchers, they may distinguish the long-tailed bird in different season as different species creating further confusion and inaccuracies. Some species not only have different appearances between genders. They also have different appearances in different growing phases. Distinguishing species is one of the difficult challenges for the new volunteers in bird counting events. Most of the birds have different appearances within the species. If the volunteers have no higher level knowledge of birds and inadequate support from the experienced bird watchers, they will make mistakes easily. Therefore, most of the volunteers in the bird counting events are non-professional, which may lead to the data become more inaccurate. Birds are hard to track due to their fast movements, and the current searching methodology does not allow researchers to track each bird due to variety of reason. Most birds are social animals which indicate they tend to travel in groups and do not mind sharing the habitat with each other. This would be because the idea of cooperative breeding is especially common in birds . Organisms like birds have been evolved to group living mammals because the importance of reproduction encourage others to protect the female and child from predators and other hazards. The need of increasing the fitness of birds in nature results in group living life style. For example, between rising a child and keeping reproduction, the bird might choose to protect the newborn instead of reproducing new ones because it understands the importance of adaptation and fitness of its descendants . Therefore, it would be difficult to count birds’ population due to high density of population, and it would be too much cost to label every single birds in the ecosystem. The time of the day can also be an important reason why data from bird counting can be inaccurate. According to the West African case study, “more birds were encountered earlier in the day”. Birds tend to be active in the early morning for variety of reasons. Even birds are social animals, privacy is still important to them. Male birds announce the ownership of their territories through sing to warn other birds to stay away from thire properties . At dawn, the temperature is low and less windy, which helps their voices to travel a longer distance. Also, because of sexual selection, single male birds always try to attract and impress female birds with their unique voices. Birds also face a smaller risk of meeting predators in the ecosystem during morning. However, since the bird counting activity is open to the public, the time slot of the survey is not only restricted to the morning, If the participants happen to take the counting different times of the day, the collected date is biased. If the participants pursue on an accurate data, then multiple visits during morning would be advised. There are about 300 species of migratory North American breeding birds, which leads to a “large-scale movement of birds between their breeding (summer) homes and their nonbreeding (winter) grounds”. Since the bird counting activity is promoted during the Christmas and New year season, the time of the year can also be a factor of inaccurate data. Birds migrate because of two main reasons, food sources and habitat selection.Few bird species hibernate during the winter time or are able to survive at the same location year round, the rest of birds are facing short or long distance migration to survive. Birds tend to find new habitat depends on the food and habitat availability. If the temperature is critical and there is a lack of food sources, birds tend to stay away from this habitat. In contrast, a habitat with suitable temperature and abundant food sources even during winter time is an ideal place for birds to migrate there for a short or long time. The bird counting activity during Christmas and New year season is worldwide, which indicates people who live in the Southern hemisphere and Northern hemisphere would observe a relatively different amount of birds’ population due to temperature and climate difference. Also, during this season, many birds might still be in the process of migration, which is hard for people to observe and count. Therefore, the data from winter time counting can be misleading and inaccurate. Bird counting is an activity that everyone can join during the winter season. It helps organizations and scientist to document the change in bird population and to study the reason behind it. However, sometimes the collected data can be bias due to uncontrollable reasons. After all, we believe what bird counting is not only an activity that contributes to conservation biology, but also a chance to have a joyful time with family outdoors. ↑ Jax, K. (2010). Ecosystem functioning. Cambridge: Cambridge University Press. ↑ Hussell, D. J., & Ralph, C. (1998). Recommend Methods for Monitoring Bird Population by Counting and Capture of Migrants. Recommend Methods for Monitoring Bird Population by Counting and Capture of Migrants,4-5. Retrieved from https://www.researchgate.net/publication/242159327_Recommended_methods_for_monitoring_bird_populations_by_counting_and_capture_of_migrants#pf3. ↑ 18.018.1 Rubenstein, D. & Kealey, J. (2010) Cooperation, Conflict, and the Evolution of Complex. Animal Societies. Nature Education Knowledge .3(10):78. ↑ Moorcroft, D., Whittingham, M.J., Bradbury, R.B. & Wilson, J.D. (2002). The selection of stubble fields by wintering granivorous birds reflects vegetation cover and food abundance. J. Appl. Ecol. 39: 535–547.